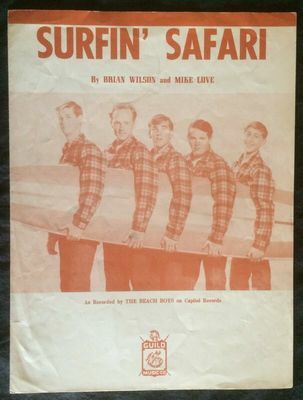 This is a 4 page piece of sheet music for the Beach Boys with the song Surfin' Safari. Sheet is a nice VG- with wrinkles on the cover and a glass ring spot over Mike Love's head. Back cover is dirty with some creases in the middle. There is a lot of writing over the musical notes on both the inside pages. I WILL NOT COMBINE SHIPPING FOR RECORDS AND SHEET MUSIC, EACH WILL BE A SEPARATE SHIPPING CHARGE. I WILL SHIP WITH CARDBOARD TO HELP STOP ANY BENDING. Mega rare The Beach Boys EP Surfin Safari/409 Capitol Sweden Exc/Exc! Very rare The Beach Boys single 45 Tears in the Morning Capitol Sweden Exc/Exc! Very rare The Beach Boys single 45 Heroes and Villians Capitol Norway Exc/Exc! Very rare The Beach Boys single 45 Bluebirds over the Mountain Sweden Exc/Exc!